Summit Ridge Group recently engaged in an exhaustive effort to document and explain the fundamental issues related to wireless spectrum. The result of this effort is The Spectrum Handbook 2018 with 392 pages with 124 figures/tables and 446 footnotes. It is a major update of out prior publication, The Spectrum Handbook 2013. The Spectrum Handbook 2018 is intended to serve as a primer on electromagnetic spectrum for those new to the industry, and also as a reference source for experienced practitioners. Hard copies of The Spectrum Handbook 2018 are available for sale on Amazon. Free PDF. versions are available on SSRN. To generate some awareness for The Spectrum Handbook 2018 (and have some fun), we started an effort similar to the “Flat Stanley Project”. The goal is to get pictures of the book in places that are unexpected, exotic, and/or famous. It’s certainly not incumbent upon readers to do so, but feel free to make a photo contribution if you are in the mood and the opportunity arises. Send to SpectrumHandbook@SummitRidgeGroup.com. See our “Where is the Spectrum Handbook” photo album. We’ve been fortunate that The Spectrum Handbook 2018 has received numerous endorsements from leading figures in the telecommunications sector. Samples of these endorsements are below. 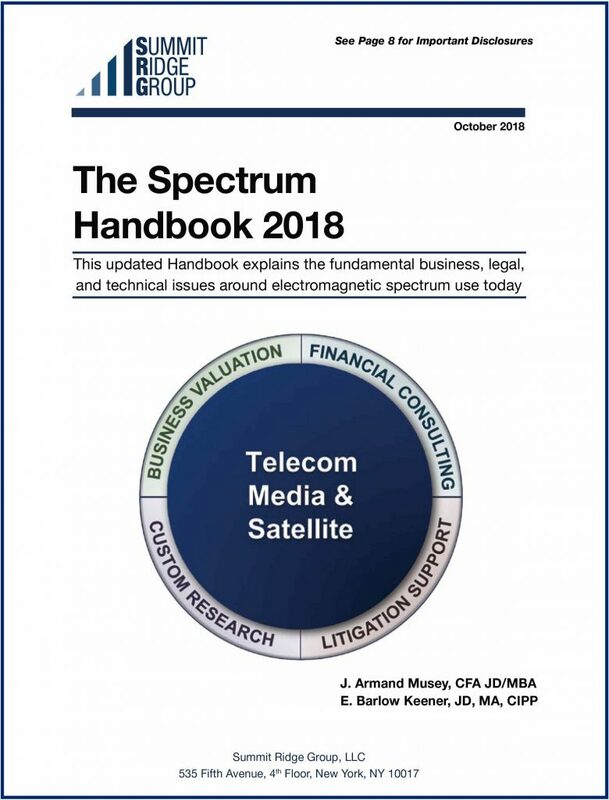 “The Spectrum Handbook 2018is an invaluable resource for operators and investors in the fixed and mobile broadband ecosystems. Summit Ridge Group has distilled the technical, regulatory and practical elements of understanding spectrum into an easily digestible and referenceable format.